Obviously this is a diving bird but which group of diving birds does it belong to? Several genera of ducks as well as loons, grebes, cormorants, coots, and alcids all habitually dive below the surface of the water from the surface of the water. Narrowing the field down, the dark breast contrasting with the paler body doesn't look right for any loon, grebe, cormorant, or alcid, but does look right for a male duck of the genus Aythya, also known as bay ducks. Of the Aythya ducks that have been recorded in Illinois, only one shows the whitish back and reddish neck of our candidate and that's Canvasback, which is what this bird is. 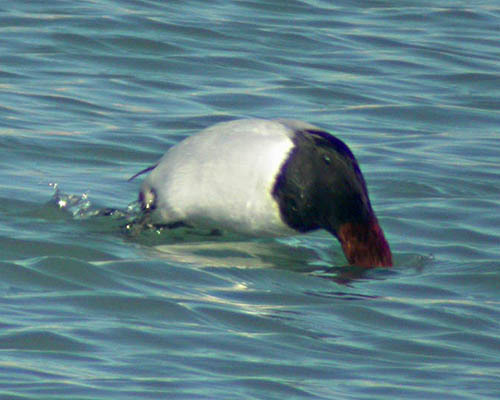 This drake Canvasback was photographed by Kanae Hirabayashi at Montrose Harbor in Chicago on January 28, 2007.